Pumpkin Pecan Caramel Bars. Time for another pumpkin treat. 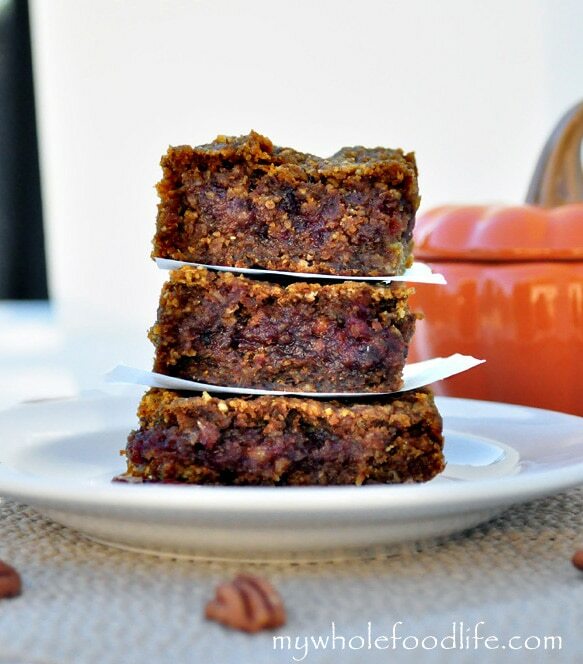 These pumpkin pecan vegan caramel bars are moist, gooey and totally delish! If brownies and pumpkin had a baby, this would be it. In fact they kind of reminded me of my Grain Free Blondies. If you are in need of a great dessert bar recipe, these pumpkin bars are a must-try. They also happen to be gluten free. Perfect for those Thanksgiving parties. You can make these up pretty quickly too. They would also be fabulous with my Pecan Caramel Ice Cream. Yum! In a food processor , combine the dates and water and pulse until you get a caramel consistency. You will need to scrape down the sides a few times. Once that is done, set it aside. In a food processor or blender, grind up the pecans and oats into a course consistency. Add that to a bowl with the remaining dry ingredients and mix well. Get a sheet of parchment paper larger than an 8X8 glass baking dish so you will have some extra paper sticking out the sides. This will make these easy to remove after they are baked. Slowly spoon 1/2 the batter into the 8X8 pan. Then add a layer of the “caramel.” Lastly, add in the remaining batter. Bake in the oven for about 30-40 minutes. I got 9 squares out of my batch and I stored them in the fridge. You can also freeze them! Enjoy! Yes. One will be fine. I have fresh pumpkin seeds from a pumpkin I just cooked. How do I use these in this recipe? Do I roast or dry them first? yum yum yum!!! can't wait to make...can you use an egg instead of a flax egg replacement? Why do you use apple sauce? Is this to replace oil? If I want to use coconut oil, should I just sub it for the apple sauce in the same amount? Fat is good! I like healthy fats, but I don't like to go overboard with them. I eat a lot of nut butter to balance it out haha! You can use oil in place of applesauce if you like. I've never used flax eggs, would a normal egg work alright in this recipe? Thanks! That is so great to hear! Thanks Scott! By 1 cup of pumpkin, do you mean pumpkin puree or just cooked pumpkin pieces? I haven't bought the canned one until now and since I have some leftover pumpkin, I wanted to make it fresh.